A couple of weeks ago, before Arsenal played Manchester City, I watched Monday Night Football. Generally, I enjoy Sky’s coverage; however on this occasion I couldn’t help but take issue with a couple of the things Jamie Carragher said about Mesut Özil and David Silva. Jamie Carragher attributes the criticism over Özil (as opposed to Silva’s praise) was because Silva “has done it since day one” while Özil has not (~7 minutes 26 secs). Carragher says that “virtually [Mesut Özil and Silva are] identical, right through the statistics” (~ 7:41). He states that this season, Özil “is at the level of David Silva, but David Silva has been doing it for 4 or 5 years”. He follows this up with some highlights of David Silva and some vague comments about “involvement” and pre-assists (the pass before an assist). So how do these points stack up with the available evidence? 1. Silva “has done it since day one” while Özil has not. Unhelpfully here (and in typical pundit fashion), Carragher doesn’t strictly define what he means by ‘doing it’. However, it’s pretty safe to say that he is referring to Özil’s production on the pitch. There are many ways to measure this, but, we’re going to keep it simple and use chance creation (shot assists and goal assists). Chance creation is chosen for two reasons. Firstly, it’s generally a good indicator of creative talent. 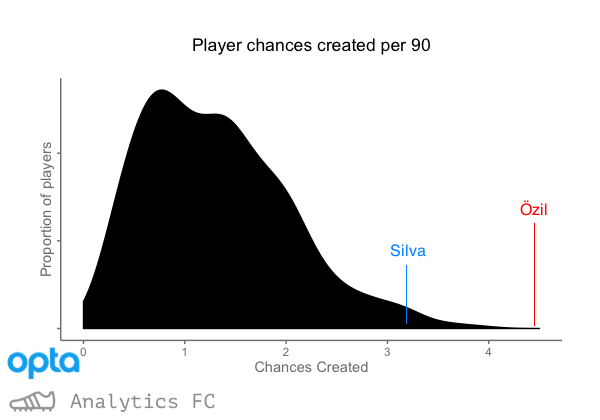 Players like Mesut Ozil and David Silva are signed specifically to get the ball into dangerous areas, and chance creation is a metric that measures this pretty well. The second reason is that this metric appears in a graphic used by MNF themselves (see below, under point 2), so they’ve clearly understood to some degree the significance of it, too. Immediately we can see the issues with Carragher’s assertion. 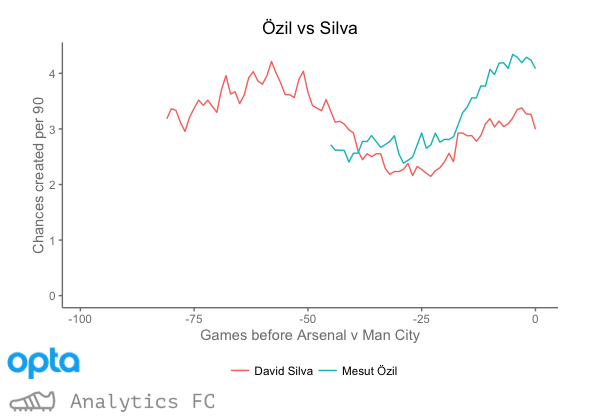 Since arriving in England, Özil’s output has been more or less at or above the level of David Silva. David Silva’s minimum output over the past few seasons is actually less than Özil’s. So if Silva has been ‘doing it’ since day one without dropping off, so has Özil. Again, Carragher’s not specific about the statistics to which he refers. However, Sky Sports helpfully provided a graphic as he was saying this, so we’re going to take the pretty safe assumption that these are the stats about which he is talking. Now for the numbers which don’t matter so much (passes, pass accuracy, and raw touches), they are more or less the same. 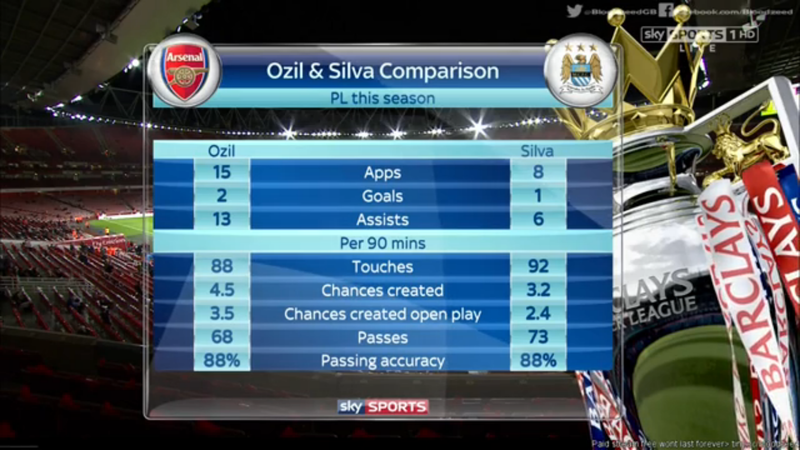 However, for chances created, Özil’s 4.5 per 90 is quite a bit higher than Silva’s 3.2. I mean, you could maybe try to make the argument that it’s not a significant difference, but that’s 40% more, and you’d be wrong. To illustrate this point, let’s look at the distribution of chance creation numbers in the Premier League (midfielders who’ve played more than 900 minutes in the respective season). The x-axis shows the chances created per 90 minutes played, while the y-axis shows the proportion of players who have achieved that number. For instance, we can see that most players create between 0.5 and 2 chances per 90. Silva’s 2015/16 total is very good. Very few players can achieve 3.2 chances created per 90 minutes played. But Özil? He’s basically off the charts. So no, they’re not virtually identical. 3. “Mesut Özil turns games; David Silva runs games”. I’ll be honest, I’m not actually sure what “running a game” really is. Feel free to disagree with me, or let me know what I’m missing (honestly), but to me it’s one of those platitudes that sounds reasonable when you first hear it, but gets less and less meaningful as you examine it. If a coach told a player, they needed to ‘run the game’. What specifically would they need to do more of? Is it getting on the ball more? Passing more? Well, as Sky Sports’ own graphic (above) suggests, they both do this in equal measure (touches and passes), so either Jamie’s just contradicted himself or it’s not that. Even with a clear definition in mind, is one demonstrably better than the other? I’m not so sure. At the very least, Carragher doesn’t, in my mind, explain adequately why would make Silva is better than Özil. There are many different ways to contribute towards the team on a football pitch. Different teams require different roles and it may well be that Özil is more valuable to this Arsenal side by ‘turning’ games than ‘running’ them. Moreover, just because one player is more obviously contributing in one way, does not mean another player’s different role is having a lower net effect on the team’s performance and overall success. For instance, if a striker consistently scored 3 unassisted goals a game and did nothing else, we would hardly criticise them for not ‘running’ the game. In fact, there is an algorithm developed to try and tease out a player’s overall impact on games beyond metrics like goals and assists: the excellent and aptly named GoalImpact. In this metric, Özil also comes out above David Silva. Maybe I’m being harsh, here. However, without clearly explaining first what he means by ‘running’ a game and second why that’s superior to ‘turning’ games, it’s difficult for Carragher’s argument to hold much weight. This last point was somewhat rebutted by Thierry Henry on the show. A player doesn’t need to get on the ball to influence the game and create space and opportunities for others. The media narrative surrounding Özil has somehow managed to become “he used to be bad, now he’d good”. But this is wrong. While his raw output has increased this term, Özil has been performing to a high standard since he arrived in England. Unfortunately, well respected journalists and media analysts like Jamie Carragher have bought into it. Of course, I don’t mean to pick on Carragher. I’m only writing this response because of the usual high standard of his work. Nonetheless, Mesut Özil has been an elite footballer for a while. It’s almost like he ran Real Madrid’s attack at 21.